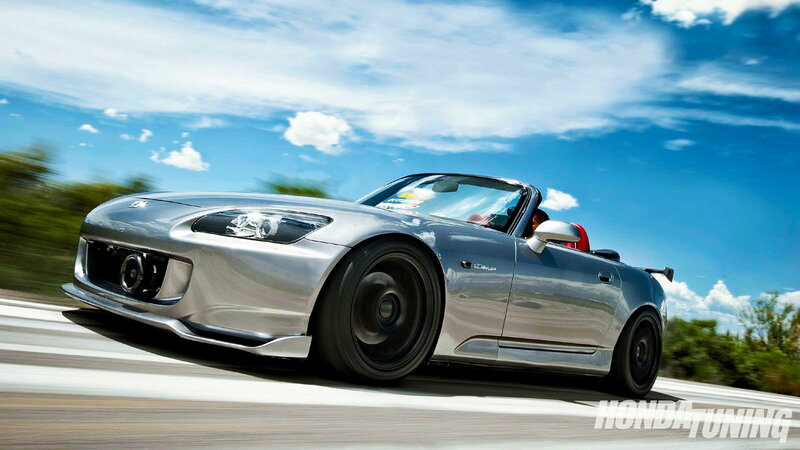 Kevin Nguyen of Aurora, CO came up with the idea to do something different with his S2000 while looking for ways to gain more power and potential performance. Now, some of us wonder things to ourselves and keep it moving with our day without giving notions a second thought but I think we all could take a note from Kevin; he voiced his thoughts to people who could help. After hitting many S2000 forums and gaining a range of responses that went from those yelling blasphemy all the way to those who had turned to the dark side and did LS swaps. However, the K-series engines got Kevin's attention as they would thrive with simple bolt-ons and be just as reliable as the stock F20. >>Join the conversation about Kevin's K20 Swapped AP1 right here in S2Ki.com. Let's take a step back for a moment to start things where Kevin first bought his S2000. It was a cold and miserable day in February 0f 2007 when Kevin decided to go out and see an S2000 that was at his local Lexus dealer and just couldn't resist. Kevin recalls "I headed out on a whim. I had no intention of actually buying anything at all, but somehow it just seduced me." After enjoying the lightweight, rear wheel drive layout of his F-powered roadster for over a year, he eventually felt that familiar grumble in his stomach that we've all experienced, and shortly after, wheels, coil-overs, a Cusco cage, and two handfuls of expensive Mugen hardware later, Kevin was well on his way to building a showstopper. "I started feeling like I was almost done, until around March of '09. That's when I started tracking the car." While getting faster on the track was nice it wasn't as much fun as he was hoping for. So then he switched directions and decided to do something quite interesting. "I sold off some of my good looking parts in order to pick up a few go-fast parts," he adds. After installing a Hondata K-Pro, intake, exhaust, and moving up to a square wheel configuration, the S2000 was capturing much better times but was still missing something. Attending multiple track days with his brother Greg and friend Mike Broddle forced Kevin to take a closer look at their K20-powered Integras. Placing his dyno chart next to his brother's K20a3, it was obvious the midrange power produced by the K series motor was far above that of the F series in naturally aspirated form. Thoughts of combining the potential of the K series with the track-friendly nature of the S2000 began to drift around inside Kevin's head. Unfortunately, to his knowledge, no one had at this point taken on this type of swap, and there were no aftermarket options or kits available to give him an edge. Being an architect by trade, Kevin got the unfortunate news during the time of the housing crisis that he had lost his job. As they say, idle hands are the devil's playground and can lead some to become stir crazy from complacency. But not Kevin: "I realized that for the time being, working on cars would keep me sane while I studied for the licensing exams, and looked for a new job. After talking to Mike and Greg about the K series potential so often, the 'crazy' switch in my head was flipped. I figured I have the free time, might as well take advantage of it." And just like that, the trio started checking prices, making up the list of what would be needed and doing it all on a limited budget. The first and most obtrusive thing in Kevin's path involved mating the S2000 transmission to the K series motor. Drawing upon his architectural roots, he utilized a CAD program to help create an adapter plate. The design was then transferred and cut out of plexiglass, and the search was on for an affordable CNC machinist for fabrication. As the project began to really take shape, Kevin determined that he'd have to sell off some of his old parts in order to make ends meet on the build. "I was able to get $1,500 for my old stuff, netting me enough money to get a set of Innovative S2000 mounts, a K24A1, and have the adapter plate properly cut. I got the adapter plate from the machinist and tried to bolt it to my S2k transmission and the K24. The thing actually lined up, which was a huge relief!" But with the swap falling into unchartered waters, there were no clutch and flywheel combos available. "The flywheel I designed in Solidworks was going to be too expensive to make. I contacted ClutchMasters, and they made me a custom flywheel and provided their stage IV clutch that was able to hold the power," he states. Next up was the throttle body placement issue. 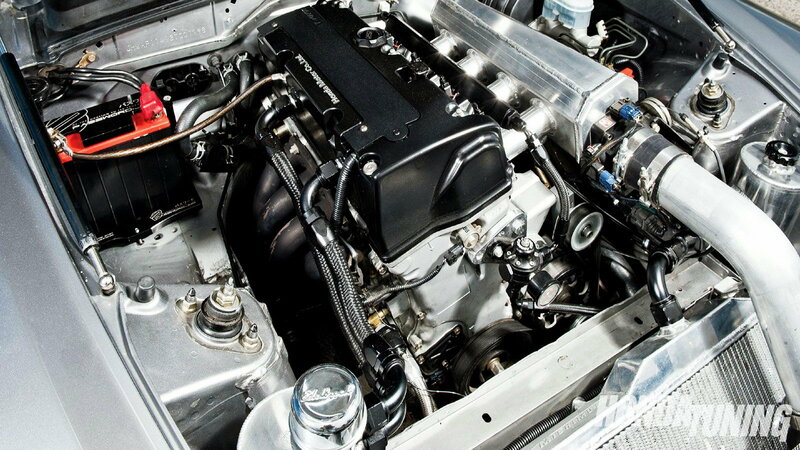 Due to the K series motor receiving air from the driver side of the engine bay of the car it came out of, the North/South mounting of the K24 would place the throttle body against the firewall. Initially, a TSX intake manifold was cut, and the plan was to fabricate a new plenum that would face the throttle body toward the front of the motor. After calculating the cost of materials and talking with the crew at K-Tuned, Kevin found that he could purchase a custom manifold from Magnus Motorsports without breaking the bank. Now that the bulk of the issue was resolved the new motor was test fitted on last time. Greg fabricated a custom wiring harness and the car was finally fired up. However, Kevin wanted more than the powerplant and pulled the motor back out. Keep in mind that everything was successful but Kevin is a thorough individual. So the motor was sent over to a machine shop where it received a fresh set of CP pistons (12.5:1) and Eagle rods. Skunk2 stage III cams, valve springs, and retainers were also installed and K-Tuned provided all of the necessary fuel components to make the swap clean and safe. Additional details like the V-mounted radiator and slick custom swirl pot and catch can setup were finished to add even more to the ground-breaking build. Kevin adds, "I got my chance to see the new numbers a few weeks later on the dyno. I gained 50 horsepower and 50 ft-lbs of torque, as well as a lot of area under the curve. This first dyno was a good baseline, but we know there is a lot more power to be had later on by taking advantage of iVTEC and getting a better header." Just beautiful and a true testament to what an owner can accomplish with the passion to never compromise their vision.